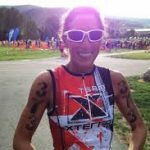 Today on the Doc On The Run Podcast we’re talking with Barbara Peterson about injury, recovery and what it takes to bounce back to championship status from a catastrophic injury. 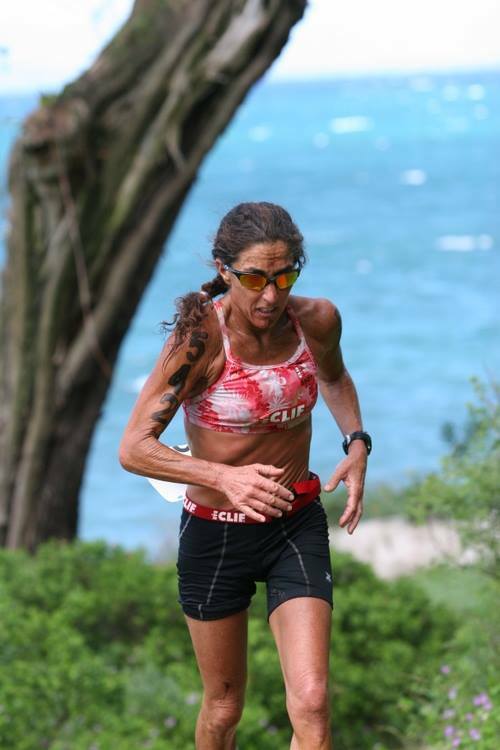 Barbara is a friend, a six (6) time world champion of the famous off road triathlon XTERRA and Barbara continually demonstrates that being fit, focused, ambitious and happy is achievable and accessible for everyone…even athlete with an injury. Barbara has a masters degree in Clinical Psychology and Eastern Philosophy and Barbara utilizes her academic athletic and life experience to help people focus on the benefits and fuel derived from exercise. Barbara practices both psychology as well as medical recovery counseling, she works as a motivational speaker and she’s the author of multiple books relating to health and wealth being that can help athletes recover better. Dr. Chris Segler: Barbara thanks for being on the call today and if you could maybe you could just give us a little additional background on you and your athletic history. Barbara: Okay. So happy to be here with you Chris, my friend and doctor for that catastrophic injury. And you’ve also helped my family with well my two daughters with their catastrophic injuries so I think we know you pretty well and I think you know us pretty well. As far as my athletic history goes, I grew up in a very athletic and outdoor oriented family and when I got out of college I found myself in California and becoming very close friends with a whole group of pioneers of the mountain bike, at which point I got very involved with mountain biking and mountain bike racing and in a nutshell that is what led me to XTERRA which is what I still do now which is Off-Road triathlon. Dr. Chris Segler: So you’re still super involved with that right. You’ve been doing this for a number of years and you’re a six time world champion, so it’s not like you just started doing this yesterday. But you’re also not only are you still doing it you’re still doing it very competitively right. So what about some of your recent races can you tell us what’s been going on with those? 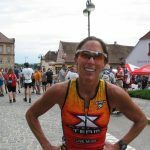 Barbara: Well I’ll happily tell you first that on Saturday, I am competing in at XTERRA Nationals which is actually being called the XTERRA Pan-American Championships. But for me that’s my 121st XTERRA. So there have been a lot of XTERRA races in my life and I have had a history of tremendous success and I’ve also has some races where I haven’t done quite as well for a couple of different reasons sometimes mechanical, sometimes I wasn’t well, and there are other times when the competition was unexpectedly good and this is why it is called “sport.” But I am still very competitive, I train as a senior athlete as if I were a pro athlete. Racing is very much part of my life and my lifestyle. Dr. Chris Segler: It seems like you’ve been able to take that lifestyle and not just incorporate it into what you do but also, you’ve been able to use that to help a lot of other people. That’s a lot of what I want to talk about with you today and why I was excited do this call because obviously the whole goal of this podcast is to help injured runners figure out what they need to do and how the can run, how they can train, how they can stay active and it’s really something that only somebody who’s really been injured can actually understand. The first time we met I remember that you were actually sitting literally in a wheelchair in your kitchen and you had just been injured and been given some pretty terrible news and, if I remember right, you were actually at the time getting ready to go defend your European title when you got injured. The morning that you woke up, before you got injured that morning, what was your plan for the day? Barbara: Long story short I basically had the bike in the hallway, had the airport coming at 3:00 in the morning to head out to XTERRA Switzerland because I actually wanted to claim my ninth (9th) European title over there. Right before going to bed which was about 11:00 at night I wanted to get a particular gift for the race director so I free climbed in my closet, located the gift and at that point lost my footing and I was about 14 feet high possibly 16 feet because we have an open type closet, and I fell like a parachuter’s jump, landing right on two feet and I have never experienced pain like that. I was screaming at the top of my lungs and my daughter came running and so did my husband and I basically started to say “I’ll be okay, I’ll be okay”. We have this cooler in the kitchen and had all the food had been taken out. But it still had ice and water in it. My husband brought that and said “Just put your feet in this cooler.” So I did and I went to sleep and I woke up in the middle of the night and tried to go to the bathroom and felt like my feet had turned to stone and I couldn’t go to the bathroom. That’s when I pretty much realized that I had done some serious damage and that I wasn’t going to be going to Europe and that I needed to see somebody in an emergency type format in the morning. Dr. Chris Segler: So you went to the doctor. They looked at you and what did they find. What were you diagnosed with? Barbara: In the emergency room in Berkeley I was told that I had two broken heels (medically known as “bilateral calcaneal fractures”). At that point I was in a state of shock but I also accepted that wow, that really was a fall. In the Emergency Room, they gave me crutches and I kind of looked at the nurse like, “I think I need a wheelchair because these crutches aren’t going to make anything happen.” One thing led to the next, I had to see a doctor in the area where I lived and I would just say it went from bad to worse. 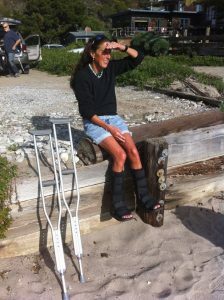 I was only given one fracture boot even though I had two fractured heels. And it wasn’t until Chris Segler was discovered (which was I think four or five days into this) that I realized I was supposed to keep the fracture boots on throughout the entire night, and that I probably really needed two fracture boots…not just one. 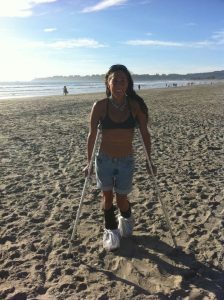 So, I had some serious issues to deal with if I ever wanted to walk correctly and maybe someday try to compete again. Dr. Chris Segler: Right. Well heel bone fractures (calcaneal fractures) are a really serious thing and they’re terrible for anyone. When I was little, my grandfather broke his heel bone and I actually still clearly remember it. What happened was, it was my brother’s birthday and for his birthday he got one of these little rockets that you fill up with water and then you pump up the handle and then the rocket shoots skyward. We went over to show my grandparents, went to their house and the rocket shot up and of course landed on the roof. My grandfather got out this old wooden ladder and he climbed up on the roof to get the rocket. When he was stepping off of the roof and back onto the ladder, the ladder shifted and he fell. At the time I thought he broke his leg. I can still clearly visualize him on the sidewalk moaning in pain. At that time I just remember him being in a cast for several weeks. He took us to the circus. He was on crutches and had a cast. I just thought he had a broken leg. I was just six or seven years old at the time anyway so I wouldn’t have really understood the significance of a broken heel versus a broken leg. But years later, after I was done with my surgical residency training I was having dinner with my grandmother. She asked what I had done that day, and I explained to her that I had done surgery that day on somebody with a broken heel bone that had to be put back together. She said “Oh did you know that’s what happened to your grandpa.” And, no I actually didn’t know that. She explained to me and said “When your brother shot the rocket up on the roof and he fell down, your grandpa broke his heel. He never had another step his entire life without pain after that. I also had no idea about that. I had never once heard him complain about it. But he was very active. He walked many miles a day well into his 80s. Barbara: He said I might not ever walk correctly again and I tell you as I’m saying this right now to you Chris, I have chills running through my entire body. I will never forget that and I didn’t know what to do, honestly. Dr. Chris Segler: That’s one of the big things about injury, you have the physical damage that has happened to…you know the fracture of the bone or the tear in the tendon or whatever it might be and that has to heal. But at the same time there is this other piece of it that happens to people that most doctors don’t even talk about which is the psychological impact that the injury has on you. And I know that as physicians were actually taught that we’re supposed to tell you the worst case scenario. I hear this virtually every time I’m lecturing at a medical conference, I hear some speaker say “Well just tell the patients the worst case scenario and then if they get better fast, or if they can run, or if they can walk, or whatever…then you’ll look like a hero.” The problem with this approach is that to somebody who’s a world champion triathlete, when you tell her she may not ever run again or you may not even walk again, that can be so crushing that you never overcome it. I don’t think that many doctors even consider the impact and that negativity can have on a patient. We talked about it but I said “I don’t know if it’s true that you’re never going to run again. So I think you’ll run. I don’t know if you’ll win another championship or not. We’ll just have to see but obviously we have to do a whole lot of things to try to get you better so that you can and we’ll have to be really creative. But obviously the goal needs to be moving forward not thinking about what you’re not going to be able to do.” Obviously things improved for you and you did get better but that’s the thing, it seems like one of the things that most physicians just completely miss is that it’s crucial to a patient’s recovery to understand the emotion behind these kind of injuries. Every athlete is more biology than machine and the emotional and mental attitude that stems from that emotion can greatly influence the healing process. I think you have to take control of that mental process when you’re a patient because you can’t expect most doctors to do it for you. Barbara: That’s exactly right but I think one of the things that helped me so much I have to say to our listeners, we know that you didn’t pay me to say this but you made it very clear from the beginning that we as a team now “as doctor and patient together” are going to do our best to make the outcome optimal. Now I always remember you using the word “optimal” and you said if I can keep my chin up and If I would let you do everything you could do medically to help me, chances are the outcome would be good. I have to say that I myself was gifted with like a positive type attitude let’s say, pat you on the back Chris to say that you really gave me promise and part of that was that you told me and I’ll never forget it, right then and there that you were going to do everything you could to make sure the outcome was optimal and it did make a difference for me. Dr. Chris Segler: Well that’s just it, that really is it. You have to have a doctor that’s on your team. I don’t have anybody in my life, there’s nobody in my life, that’s involved in my life who I don’t believe is interested in the things that are best for me and those around us. I think having really positive people surrounding you is really really crucial. I don’t think there are lots of world champion athletes in any discipline that are surrounded by people that keep telling them they can’t do something. Dr. Chris Segler: I just think that’s it. I don’t think that there are many Olympians that have friends, family members, coaches, anyone that says “You can’t win that, why are you going to Rio?” It just doesn’t work that way. It does confuse me when I when I hear other doctors and I read journal articles or things in textbooks that suggest that we should tell patients that they in fact shouldn’t get better when we don’t know that that’s true. If you know that it’s not true I believe that that’s obviously the best thing to do. So if somebody has a spinal cord injury and then there’s no possible way that any doctor would believe they’re ever going to walk again, it would be irresponsible obviously to tell that they can run. But when someone has an injury and you don’t know what the outcome going to be, there’s no reason to say “Well you’ll just never run again”. Because it’s not helpful to your cause of wanting to run again. I know that it had to be a really difficult thing for you but you did take action right away so you know we said “Okay well what can you do” and we tried to figure out what can Barbara actually do right now. 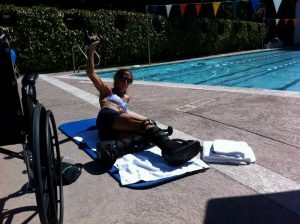 I think the next day you sent a picture to me where you were sitting in a wheelchair by the pool with your fracture walking boots on and you swam two miles or something the next day. Barbara: Well actually, it’s a little different. It’s really wonderful. That’s also something I’ll never forget. So you put a cast on my foot in my kitchen because you’re “Doc On The Run” and you come to people’s homes. And then two days later I told you that I thought I got it wet. Like I don’t know exactly what I was doing and you said “Well let’s cut it off”. You guided me so that I could get it off. Maybe this is okay to say or it’s not okay to say but then I said, but what I really like to do is not have a cast on and get my fracture boots wet. I’d like to swim and would it be okay as long as I’m wearing these fracture boots”, and your response was “knock yourself out.” I’ll never forget it. It was like “Yeah it’s all okay Barbara, you can move your body as long as your feet and your legs legs are in those fracture boots. And it was you who came up with the idea”. You said, “Well I can tell you are someone who is going swimming every day here, so why don’t we get you two pair of fracture boots because you cannot be sitting in a pair of wet boots”. Honestly, just your willingness and positive nature, I tell you it was part of my healing process. So thank you. Dr. Chris Segler: Yeah, of course but it seems like the thing that really happened with you is that you pretty quickly shifted from sitting in the emergency room and basically you shifted from this idea, “okay I’m going to go defend my European title” and “I’m in pursuit of this athletic goal” to you’re in pursuit of a real active recovery to get the best possible outcome. And it seemed like you were able to switch that pretty quickly. Switching your path quickly is really helpful and I think it’s helpful for injured athletes at all levels. I read this all the time in articles from coaches and they’ll say you have to have a key goal for your race but you also have to have sort of a “plan B” because if you race enough something is going to go wrong. One time, I drank the water in Mexico the night before an Ironman. That’s not really the best way to hydrate, so I had to have a plan B because the whole goal that I had when I woke up that morning and felt sick was clearly not going to happen. And you have to be able to redirect very quickly if you want things to go well. It seems like when athletes prepare for a whole season and they train for months and months, they understand about having these sort of different levels of goals. But then when somebody gets injured it seems like they have one single goal that they’re having a hard time letting go of and have a difficult time redirecting their focus in a way that’s positive for them. How did you make that shift is it just because of your background in sports psychology, or because you’ve done so many races? What do you think it was that helped you switch so quickly? I really chose to focus on what can I do, not only for healing but to get my needs met, my physical, athletic, active needs met. That’s when I think before I went swimming I figured out that I could do leg lifts. When I was doing like a thousand leg lifts and I was doing these little yoga bends and such from the wheelchair. For me, it’s what can you do, not what can’t I do. I tried to really go forward with that perspective and that attitude. Dr. Chris Segler: I know it’s difficult right? It’s a rough shift and one of the things I really remember from our first meeting was that as soon as we talked about the fact that you know there’s you know I don’t see any way that you’re going to be out of these fracture boots in less than a month. 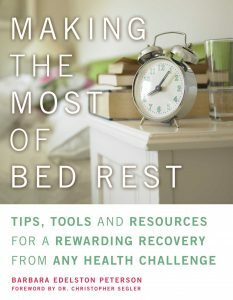 You sighed and said “Well I guess I’ll finally get to finish writing that book I’ve been working on”, and by coincidence you had been working on a book on bedrest and there you are basically more or less stuck on bedrest in a wheelchair. It’s kind of ironic, but there was your opportunity. But then we had a talk also then about the importance of real rest and that this does happen with lots of athletes…they get injured and they immediately try to shift their focus and energy to some kind of work project or something that may or may not have a realistic deadline and they might stress themselves out so much with that additional project that they’re really not adequately resting. Once it really settled in and you realize that you really did have a serious injury, what were you doing to really facilitate the rest? Because you had to recover as quickly as possible. So what did you shift if anything to make sure that you’re getting adequate rest? Barbara: Well that’s a great point and I agree with you that it is very important not to just blaze on and pretend in a way nothing’s really wrong even though obviously there’s a major injury going on. I would say a couple of things. Well one is psychologically or emotionally and or emotionally accepting life suddenly changed. I’m not as fully able as I was 24 hours ago. So I have to accept it and make the most of it and I am going to have to rest a little bit. There are going to be limits. It’s just the way life is sometimes. I think it’s unfortunate when certain people just can’t accept that quote “Life happens” at times. In my case, reading along the lines of the books that I had written on being bedridden and being immobilized and at a certain point you just have to re-channel your energy, accept the situation, make the most of it, find times to be very quiet and also find times when it’s appropriate to be active in whatever way that’s possible given the injury. Dr. Chris Segler: So you were obviously able to do that. You were swimming a lot. You were doing all these exercises at home and you really put in a lot of effort into being creative in figuring out how to really get back to training and maintain your strength and not just whether away as most people would after this kind of injury. That takes a lot of different things. Obviously you have to be active, you have to rest and you have to have appropriate nutrition. No athlete is confused about this. Nobody reaches any kind of elite level of competition without a focus on nutrition. Was there anything in particular you changed? Obviously somebody like you has a really great diet but was there anything in particular that you changed with your nutrition specifically to help facilitate your recovery that was something you weren’t doing as a normal part of your routine or was your nutrition as an athlete sufficient to really facilitate the recovery that you had from the heel bone injury? Barbara: Well great question, because in fact there were some major shifts and some of that you and I discussed at length because I wasn’t sure about what I could do and I knew I wanted to do something. So we discussed bone meal and I had somebody go out for me and get bone meal from I think it was Whole Foods. I did special calcium tablet. I ate a lot of vegetables and not as much fruit because that was fruit with so much sugar. Vegetables contained a lot of calcium and potassium and magnesium for the healing process. I’m just going to go back for two seconds about resting and how it also integrates with nutrition and expanding myself to accommodate this serious injury. I would say it’s really important to have respect for an injury and what it really does take to heal. I think I would say I got an A-plus in terms of respecting the situation but I have to say I also had the greatest doctor. So it wasn’t hard to respect the parameters that you set for me and then together some of the wild aspects and by wild I mean just thinking outside the box. I did not have to sit there inactive but I did have to find a sweet balance and that was being active so that I felt somewhat physically and spiritually fulfilled. Finding the rest required to promote healing and finding a sense of contentment in the context of I’m injured and there is not just any injury. These are calcaneus heel fractures and it is not just one it’s two and I’ll never forget when you explained it to me. “Just think about eggshells Barbara, every time you might want to do something you’re not supposed to do (which was really not my case) but somebody else might might want to just go for it in a way that was inappropriate. Just think about what it would be to have eggshells around your feet and they were trying to heal”. That really, I guess for me established that context in which to make the best of bilateral heel fractures. Dr. Chris Segler: It’s very difficult but you talked about finding a sweet spot or the balance in between your letting your body recover but then also maintaining a level of activity that’s appropriate for you to still heal while you maintain some physical and spiritual life balance that you’re used to. I really and truly believe that most athletes, people who are chronically active that have had a lifetime of activity, if you just completely stop all their activity lots of bad things happen. You get weak, you get stiff and many of us get depressed. Barbara: They say grouchy too. Dr. Chris Segler: But you’re right, it’s more than that. Clinical depression happens a lot when athletes just stop exercising because it completely changes our hormonal balance. So that is a thing that’s unique to athletes but it’s something that has to be considered. People who are habitually sedentary (like the bulk of America) they doesn’t really exercise on a daily basis. When you tell them just to sit still it doesn’t change much. Their cortisol levels don’t go up the same way that it does for an athlete who completely stops exercising. I’m the same way. I exercise all the time. So if I don’t exercise for a few days in a row, everybody around me seems to know it. And to not exercise for weeks would be a terrible thing for me. But it’s not just about being grumpy or grouchy though, the problem is is that when an athlete stops exercising and their stress hormones go up and this hormonal imbalance starts to actually negate the healing process, you have a bigger problem. Trying to find ways for you to be active is a part of the recovery I think. If you’re going to get back to activity you have to keep that stuff in balance before you can start doing all the strengthening that allow you to return to activity. That’s a big thing that I see with athletes is that we’re told by lots of doctors that rest is the opposite of activity. For people like you, and for most athletes who are actually competing, rest is somewhere in between. It’s being active. It’s not running necessarily, but it’s not completely sitting still. Sitting completely still is also not good for us runners because you have to get back to activity and the activity that we’re talking about his high level athletic activity. We’re talking about running. You can’t just be sedentary for a month or two and then expect to ramp up and return to running and competing. That kind of brings us to the next thing to talk about and that’s strengthening before returned activity. We’ve all had experiences being injured and having some doctor tell us “Well, just use pain as your guide”. I remember when I had a reconstructive knee surgery and been immobilized for prolonged period of time and I wanted to run, I wanted to get back in the gym and I wanted to do lots of stuff and the orthopedic surgeon just said “Well you just use pain as your guide”, and I still remember sitting in his office thinking what does that mean. What do you mean use pain as my guide? Because every time I run I feel pain at some level if I’m doing it correctly, every time I lift weights I feel pain at some level if I’m doing it correctly so what does that mean. I don’t get it. Just like training for a key race in the racing season itself we know that it’s better to have a stepwise progression and a specific strengthening of muscle groups that supports the activities that you need to participate in and we know that core strength is something that you can work on even if your foot is injured. So you were doing that right away. It seems like it’s best to first of all apply your efforts to strengthen everything that’s going to support that injured limb before you return to running and full training and that’s really what you were doing. So what do you think were the most helpful things that you did that actually were allowing you to get back to running and training because you do you did get back to those things pretty quickly? You were training again pretty quickly once you were able to run. So you know did you ease into running or what were your first runs like after you actually started running again and then? How did you progress and get you know so that you could get your volume back up and feel confident that you were okay to run? Barbara: Okay yeah, you just used the key word “confidence” so I think again going back to our earlier discussion about teamwork and I mean knowing that your doctor is there for you and knowing that your doctor knows what he or she is doing is a big part of feeling confident to get back. 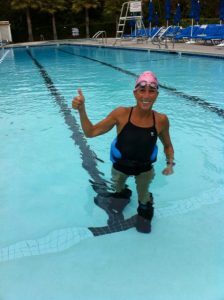 I remember you set out a plan for my return to walking and I had to be in the pool and I had to have the fracture boots on and you said that I would have to start with 10 minutes. I think it was five minutes actually and I was like “Well yeah, no problem. You know, five minutes”. Well I couldn’t do it. I actually, it really it did hurt and I didn’t feel strong enough and I do remember calling you and you said “It’s fine. It’s going to take a progression”. I said “Yup it is and I’m shocked by it”. Well let me back up and just say I was 100 percent confident that the time I gave to the healing and your assessment of my healing was I was healed. Like the calcaneal fractures were healed, I could begin activity. So that’s number one. Just knowing from the medical perspective, well from the doctor that it’s okay to continue and that you know in your own heart you gave it enough time to have a step one, step two,no pun intended was the progression and not pushing it but not giving up and really going after maybe two times a day, maybe four times a day. Once I was able to walk and it was awkward and it hurt a little bit, I just decided with your permission that I would start to run. And that was again I’ll just say after a series of walks. So I went to a place that I loved. I went all alone. I did not want anyone to see me and I just began to do what it was I wanted eventually to do. So I started running but it wasn’t quote running. It was something different. I would never want to be videoed or anything. But one day after the next after the next after the next it, started to come back. When you know you’re healed, when you know that your training, training is really not the right word just working towards doing something to find normalization. It comes, the body does heal. Dr. Chris Segler: Well it’s difficult to be patient for that return if you haven’t been through it. But I’ve been through it, I’ve had surgery. I’ve had other things happen to me and other kinds of injuries and it is very difficult. It’s easy now that I’ve been through it a couple of times. I had surgery about a year ago and I couldn’t run or exercise for three weeks. And three weeks is a really long time for me to not exercise. The first time I went out and ran after that, I was running much slower than I would normally run even during an Ironman. So it was really slow but that’s what it was. I didn’t beat myself up about it. I just realized “well you know you’ve had surgery and you hadn’t run and this will change.” And it changes very very quickly. It’s very difficult to not believe the Garmin and call it my new reality and it’s just the reality of the moment. But it’s so hard. Barbara: But I think Chris don’t you agree though the word “respect” kind of sums it up. I mean an injured individual has to respect the process. When you respect the process and you know that you’re doing everything and it is a progression. I guess respect and trust because we do heal and we can come back. Especially if it’s an athlete who is recovering. I mean the harder issue is when people you know aren’t, don’t have a history of athletics and that’s more along the lines that the kind of work I do where it’s really like sedate people who have to try to recover. Well for them, just taking one step at a time and getting back to something “normal,” for them it’s like doing an Ironman. But at a certain point I mean probably for you when you had your surgery a year or so ago and I had my bilateral heel fractures, there’s a certain level of respect and healing is the name of the game and then time. Dr. Chris Segler: Right, you have to understand all those pieces and you do have to understand that things are going to get better. You are going to get faster, things are going to come around again, you are going to feel like you’re you when you run again and not somebody that you know wouldn’t want to be videotaped, like you said. But you know it’s interesting because we all think about that. It’s not just how fast we’re going but it’s how it feels and how we think it looks and I think it was about eight months after your actual injury and you know that you had been told that you’d probably never run again by a doctor. Then about eight months later, I went to Hawaii for the XTERRA world championships and I really only remember two things about it. One of them was it was the year of Lance Armstrong was racing and I remember standing in transition and seeing Lance Armstrong come in off the bike and take off on the run. I think he was in second place at the time. Then I remember after the race what you said to me was you said “Well you know Chris, I guess if you really knew me, then at the end you could tell I was limping a little bit” and then you said ”What don’t think?” And I said “I don’t think it gets any better than world champion.” And that’s the thing…it’s it’s all about perspective, right? You did win. You have won a bunch of times since and you’re still you. You’re still the same person, you’re still the same energy and you still do all the same things that you love and so now you’ve also taken all of that it seems and been able to help lots of other people. So what are you doing now in terms of helping other athletes and those who have been injured and what sort of work are you doing so that you can help other people? Barbara: Okay. The venues that I’m using are, it’s multi-fold, but writing and books and the second edition did finally come out and it was way more about immobility than bed rest having been more immobilized than bedridden by these bilateral heel fractures so that book and the clientele that that has brought to me from pregnant women who are bedridden due to high risk pregnancies or preterm labor or people who have been injured or people who have been through surgeries that limit them and then they have to return to some kind of level of activity. I not only help them with counselling and just attitudinally but I also do house visits and meet them also in different clinics. I work at a particular clinic that’s a back surgery clinic and that’s with mostly non-athletes and that’s really a lot of psychotherapy almost just to explain you know if you trust, if you respect, if you visualized what is you really expect to do and what is what to do. At the end of this injury you’ll get there. We just have to set that goal up and then we have to work real hard to get there and that these are the steps we can take and this is your daily attitude You know something along those lines. So then there are some other venues that I’ve been involved with through kind of healthy snacks. Just working with all sorts of people of all ages just to promote wellness. It’s beyond the injury. But it’s really just living life with respect and goals and healthful practices and happiness. Not only from the individual perspective but just from ability to expand that energy, a positive energy outward to a community, to a school, to the world. It’s very positive. Dr. Chris Segler: So for those who could use your help in terms of recovering either from an injury or even if they’re just pursuing an athletic goal. What’s the best way for people to find out about you and learn more about how you can help them. Barbara: Probably the best way is to go to my website which is projectbemoved , no spaces just projectbemoved which I really say is a lot of what we’ve been talking about. You know there’s movement and then there’s being moved by life, by athletics, by wellness, by recovery, and I think that’s so much a part of life. You know what I said about my bilateral heel fractures whether it be on Facebook or articles I wrote or even in my second edition of the bedrest book, it really gets summed up by quote “Life happens”. So my projectbemoved is kind of about being moved by life and moving in life. Dr. Chris Segler: So for all of you reading or listening, head over to projectbemoved.com, so you can reach out to Barbara directly. Thank you very much Barbara for coming on to the podcast and to share with us today about how it is that you can actually recover from a real catastrophic injury and not just return to activity and not just get walked back to walking but also get back to running and competing at a world championship level. Barbara: My pleasure and thank you for all that you gave to me and all that you continue to give to so many others. It’s what I think life is all about. Thank you Chris. «« Metatarsal stress fractures six weeks of no running and other myths.